BEFORE: I am entering this program because I want to take back control over my health. It goes beyond resolutions- it’s a lifestyle change that I intend to stick with. Being a second year medical student I find myself sitting down and studying all the time and it is catching up to me! My energy isn’t what it needs to be, my back and body aches, and I am not consistent with my diet. 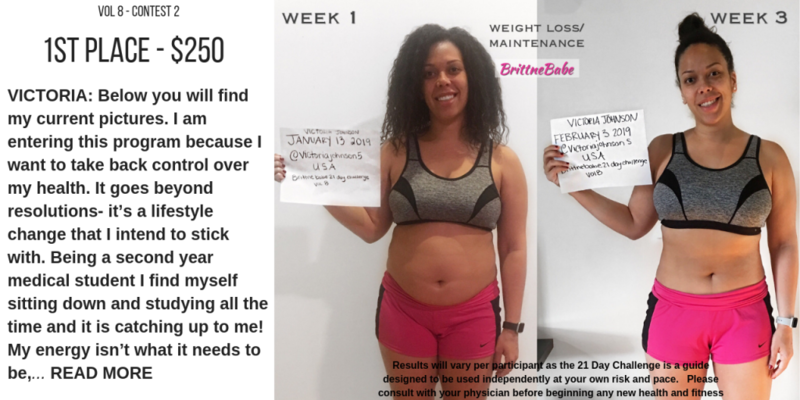 I feel like this program will be a great kick start into a healthier version of myself and I’m excited to begin this journey with the Brittnebabe 21 day challenge! 21 Days AFTER: This program absolutely worked for me and I’m so glad I did it! I can see and feel the difference! My clothes fit better, and I have more energy and confidence! I was tired of my routine of sitting and studying for most of the day, and this challenge got me up and moving and also pushed me to be more diligent with my nutrition. I look forward to continuing on my fitness journey and am grateful for this amazing jumpstart!